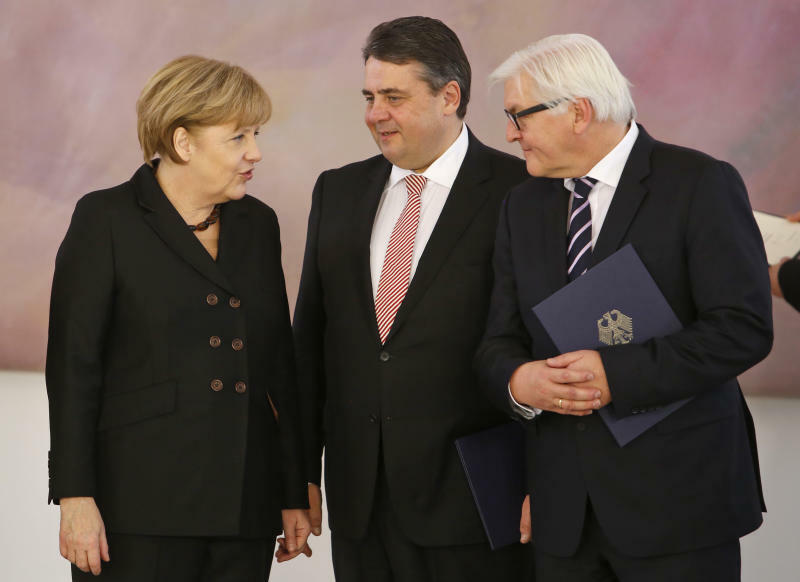 BERLIN (AP) — Angela Merkel has won over Germans once again. The 59-year-old, no-drama leader has weathered turbulent economic times, firmly establishing Germany as Europe's financial taskmaster while preserving its welfare comforts and status as a reluctant world power. Since entering politics in her mid-30s after a career as a physicist, Merkel has earned a reputation as an effective operator on the international stage, warming ties with the U.S. that had been frayed by German opposition to the Iraq war and brokering compromises among fractious European Union leaders. She has already achieved a number of firsts: the first German chancellor from the former communist east and the first woman to lead the country. "It is said of her that she doesn't specify what is at the end of the journey, but she governs with a steady hand," Lothar Probst, a political scientist at the University of Bremen, told Phoenix television. "People clearly like that. They have confidence in her and she is unpretentious." It's a style has served her well with an electorate that doesn't yearn for radical change or charismatic leaders after the turmoil of the 20th century, which saw Germany defeated in two World Wars and then divided into two rival states. 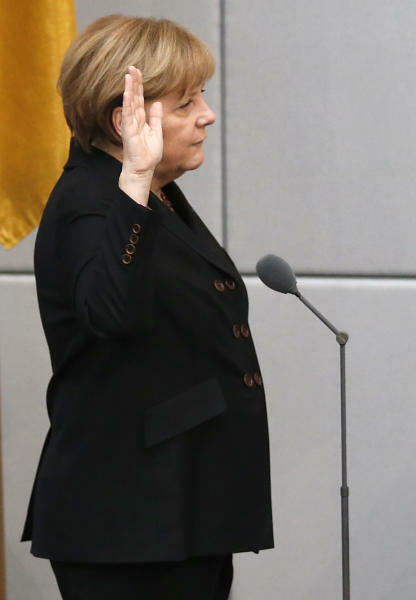 Merkel was sworn in Tuesday for a third term as chancellor at the head of a "grand coalition" of her conservative Union bloc and the center-left Social Democrats, traditional rivals who together have a huge parliamentary majority. At home, she has taken a relentlessly pragmatic approach, nudging her conservatives toward the center on issues such as an end to military conscription and her decision to phase our nuclear power after Japan's 2011 Fukushima disaster. Instead of oratorical flair or talk of a grand vision, Merkel projects a nurturing image of someone who occasionally does her own grocery shopping, enjoys baking and buys clothes off the rack in Berlin department stores. She and her second husband, chemistry professor Joachim Sauer, live quietly in a Berlin apartment without the trappings of the White House or Britain's No. 10 Downing Street. 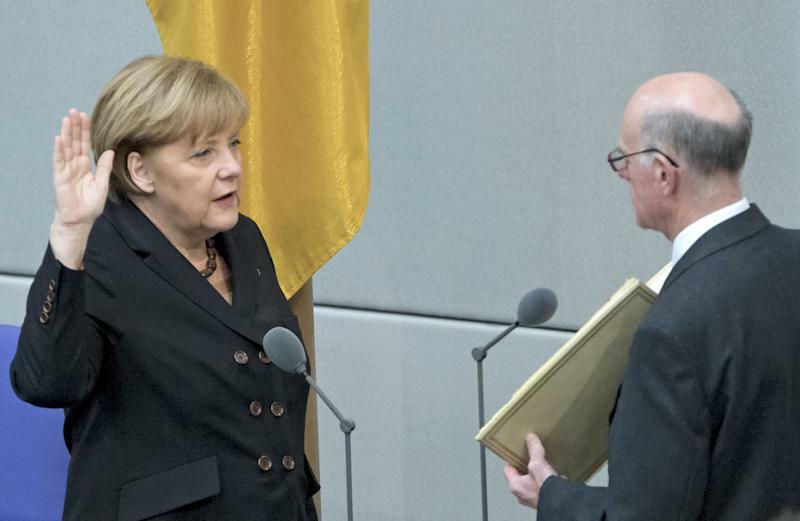 Merkel returns to the chancellery as Europe is still struggling from debt-fueled recession. Germany's relations with its chief ally, the United States, are strained over reports that the American spy agency monitored her cellphone and collected electronic information from ordinary Germans, a practice that harkens back to dictatorial rule by the Nazis and East German communists. But those great issues have taken a backseat in the wake of her re-election. Instead, Merkel says her new government's priorities will be "solid finances, secure prosperity and social security" — with a mixture of center-left priorities such as a new national minimum wage, a pledge not to raise taxes and another to stop running up new debt. "Together, we want to make sure that people in Germany are doing even better in 2017 than today," she said. Merkel has managed to lead Europe's biggest economy through the 2008 financial crisis and now the eurozone debt crisis without inflicting on Germans the kind of painful reforms and spending cuts that other Europeans have had to endure. Labor-market reforms enacted by predecessor Gerhard Schroeder a decade ago have been credited with helping Germany weather the financial crises, while Merkel has benefited politically from low unemployment and economic growth. In Europe, there will be little change to Germany's tough-love economic approach of offering struggling countries aid in exchange for reforms. Finance Minister Wolfgang Schaeuble remains in his job and the coalition agreement states there will be no pooling of European countries' debt. Germany has been far less assertive on the global stage and that won't change. New Foreign Minister Frank-Walter Steinmeier noted approvingly that outgoing minister Guido Westerwelle "adhered to Germany's policy of military restraint. That wasn't always easy." New Defense Minister Ursula von der Leyen, the first woman in Germany to take the job, has emphasized making the all-professional military an attractive employer rather than talking about future deployments. Germany has a large contingent in Afghanistan, but stayed out of NATO's mission in Libya and other missions. The opposition will struggle to cause Merkel any trouble over the next four years, with two left-leaning groups holding only 127 of the 631 parliamentary seats. Even von der Leyen, who is widely viewed as a potential successor, dismisses any talk of a post-Merkel time. "I don't like this speculation," von der Leyen said. "I am deeply convinced that we have the perfect chancellor. In every generation, there is one chancellor. In my generation, that is Angela Merkel."